It is dangerous to shift the automatic transmission out of parking position P or neutral position N if the engine speed is higher than idle speed. If your foot is not firmly on the brake pedal, the vehicle could accelerate quickly forward or in reverse. You could lose control of the vehicle and hit someone or something. Only shift into gear when the engine is idling normally and when your right foot is firmly on the brake pedal. The DIRECT SELECT lever is on the right of the steering column. The DIRECT SELECT lever always returns to its original position. The current transmission position P, R, N or D appears in the transmission position display in the multifunction display. - Push the DIRECT SELECT lever in the direction of arrow P.
The automatic transmission shifts automatically into park position P if you open the driver's door when the vehicle is stationary or driving at very low speed, and the transmission is in position D or R.
If the engine speed is too high or the vehicle is moving, do not shift the automatic transmission directly from D to R, from R to D or directly to P. The automatic transmission could otherwise be damaged. Park position P is automatically engaged if: - you switch off the engine using the SmartKey and remove the SmartKey, or if you switch off the engine using the Start/Stop button and open one of the front doors. - the HOLD function (Y page 179) or DISTRONIC PLUS (Y page 169) brakes your vehicle until it is stationary and at least one of the following conditions is fulfilled: - there is a system malfunction. - there is a severe uphill or downhill slope. The electric parking brake is then also applied. Only shift the automatic transmission to R when the vehicle is stationary. - When the vehicle is stationary, depress the brake pedal. - Push the DIRECT SELECT lever up past the first point of resistance. - Push the DIRECT SELECT lever up or down to the first point of resistance. If the engine has been switched off, the automatic transmission automatically switches to N.
When leaving the SmartKey in the starter switch, do not leave children unattended in the vehicle. It is possible for children to switch on the ignition which could result in unsupervised use of vehicle equipment. Unsupervised use of vehicle equipment could result in an accident and/or serious personal injury. - make sure that the ignition is switched on. - when the vehicle is stationary, depress the brake pedal and keep it depressed. - shift to neutral N.
- release the brake pedal. - if applied, release the electric parking brake. - switch off the ignition and leave the SmartKey in the ignition lock. - engage park position P.
- remove the Start/Stop button from the ignition lock. - insert the SmartKey into the ignition lock. - switch on the ignition. - depress the brake pedal and keep it depressed. - Push the DIRECT SELECT lever down past the first point of resistance. The current transmission position is shown in the multifunction display. The arrows in the transmission position display show how and into which transmission positions you can change using the DIRECT SELECT lever. If the transmission position display in the multifunction display is not working, you should pull away carefully to check whether the desired transmission position is engaged. Select transmission position D.
Do not restrict the shift range. Do not shift the transmission into position P(Y page 155) unless the vehicle is stationary. The parking lock should not be used as a brake when parking. In addition to engaging the parking lock, you must always apply the electric parking brake to secure the vehicle. If the vehicle electronics are malfunctioning, the transmission may be locked in position P. Have the vehicle electronics checked at a qualified specialist workshop, e.g. an authorized Mercedes-Benz Center, immediately. Only shift the transmission to R when the vehicle is stationary. Do not shift the transmission to N while driving. Otherwise, the automatic transmission could be damaged. No power is transmitted from the engine to the drive wheels. Releasing the brakes will allow you to move the vehicle freely, e.g. to push it or tow it. only shift the transmission to position N if the vehicle is in danger of skidding, e.g. on icy roads. If you switch off the engine using the SmartKey or the Start/Stop button, the automatic transmission shifts to neutral N automatically. Rolling in neutral N can damage the drive train. The automatic transmission changes gear automatically. All forward gears are available. Use kickdown for maximum acceleration. - Vehicles for USA: fully depress the accelerator pedal. The transmission shifts to a lower gear depending on the engine speed. - Vehicles for Canada: depress the accelerator pedal beyond the pressure point. Rocking the vehicle free by shifting back and forth between transmission positions D and R can help to free a vehicle that has become stuck in mud or snow. The engine management system of the vehicle limits shifting back and forth between transmission positions D and R to a maximum speed of 5 mph (9 km/h). To shift back and forth between transmission positions D and R, move the selector lever up and down beyond the pressure point. When working on the vehicle, engage the electronic parking brake and shift the automatic transmission into park position P.
- Drive in the middle of the engine speed range on uphill gradients. - Depending on the uphill or downhill gradient, shift down into shift range 3 or 2, even if cruise control or DISTRONIC PLUS are switched on. 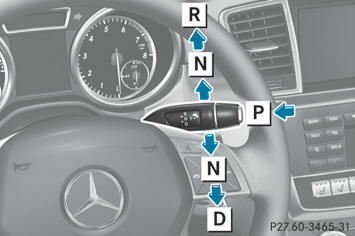 You can restrict or derestrict the shift range by using the steering wheel paddle shifters 1 and 2. You can only change gear with the steering wheel paddle shifters when the transmission is in position D.
In transmission position D, you can use the steering wheel paddle shifter to restrict or derestrict the shift range for the automatic transmission (Y page 147). The shift range selected is shown in the multifunction display. The automatic transmission shifts only as far as the selected gear. You can use the engine's braking effect. - Pull the left-hand steering wheel paddle shifter. The automatic transmission shifts down one gear and restricts the shift range to the relevant gear. If the engine exceeds the maximum engine speed when shifting down, the automatic transmission protects against engine damage by not shifting down. If the maximum engine speed for the shift range is reached and you continue to accelerate, the automatic transmission shifts up, even if the shift range is restricted. This prevents the engine from overrevving. - Pull the right-hand steering wheel paddle shifter. The shift range is derestricted. - Pull and hold the right-hand steering wheel paddle shifter until D is shown again in the multifunction display. The automatic transmission shifts from the current shift range directly to D.
- Use the DIRECT SELECT lever to shift the transmission to position D.
- Pull the left-hand steering wheel paddle shifter and hold it in position. The automatic transmission shifts to the gear which allows optimum acceleration and deceleration. To do this, the automatic transmission shifts down one or more gears. The transmission has problems shifting gear. The transmission is losing oil. - Have the transmission checked at a qualified specialist workshop, e.g. an authorized Mercedes-Benz Center, immediately. The acceleration ability is deteriorating. The transmission no longer changes gear. The transmission is in emergency mode. It is only possible to shift into second gear and reverse gear. - Shift the transmission to position P.
- Switch off the engine. - Wait at least 10 seconds before restarting the engine. - Shift the transmission to position D or R.
If D is selected, the transmission shifts into second gear; if R is selected, the transmission shifts into reverse gear.